If you've ever searched a technical question about pinball machines on the internet, then it's quite likely you would have come across an answer/solution posted by LTG :) on Rec.Games.Pinball (RGP). So who is this LTG :) fella, and what makes him tick? 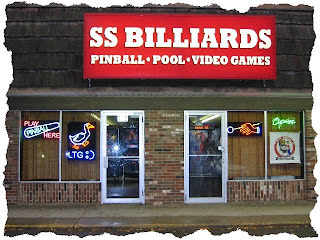 The Pinball Blog attempts to find out more about the man from SS Billiards who can. The Pinball Blog. On RGP you are possibly the leading authority on pinball repairs and tips. Where did you learn it all? LTG :) I sincerely doubt I'm the leading authority on RGP for pinball repairs. There are a lot of people there who contribute a lot, and sadly a lot of them don't get the recognition they deserve. Whether it's complicated tech help, parts, a favor, etc. RGP is loaded with a wealth of good help dedicated to pinball and this has always made me feel honored to be a part of this newsgroup. I do think a lot of people identify with me. Especially people new to the hobby. If I can help with their problem, I try to figure where their repair skill level is at, and work through to a solution for them so they can make the repair and gain in confidence and repair skills. My thinking has always been that if a new person comes for help and gets it, the hobby grows and gets stronger, and that helps everybody. On other newsgroups new people ask a question and get flamed, and that hurts the group and particular hobby. Check out one of the barren newsgroups and what stuff sells for in that hobby, and it doesn't take a genius to figure out that they destroyed it themselves. RGP generally is more humane towards new people. A few are gun shy and will email me rather than take a chance on the newsgroup. They usually start off with an apology for contacting me directly, but they need help. I don't ignore them or blast them out of the water. I always respond and start off with " Hi my friend, good to hear from you". As far as learning, I've spent near half a century in coin op. I remember being about 4 years old and standing on a stool and scrubbing a baseball machine playfield with comet cleanser. Most of my years were pre-internet and instant help. You needed to get something fixed, it didn't matter if you knew how or had parts or not, you figured it out. The process of needing to learn probably helped me. TPB. Are you still learning today? LTG :) I think as long as a person is alive they are learning. Technology changes, parts quality changes, we are always learning better ways to care for our games. The manufacturers weren't building them for collectors many years later. The sheer number of years collectors are getting out of their games and the quality of the game's condition, is testament to a lot of learning. And I'm still forgetting too. As things change and we leave things behind, you don't remember everything. I used to be pretty sharp with EM games and pinball machines, it's probably been over 25 years since I've been in one. I'm sure I'd be lost for a while and have forgotten the basic problems and what to do for them. TPB. Although currently a tough-time for coin-op you must have some incredible highlights from your time in the business. Is there a moment that particularly stands out? LTG :) From a business standpoint it would be October 23rd, 1987. A Friday, I had just put in the new rug, gotten Sega's sit down afterburner. MEA week, kids had off from school on Thursday and Friday. That Friday I set a record for one day income in my business, just 5 years after the video game fad flopped, a time when I didn't know how much longer I'd be able to remain open. And I managed to bring my business back huge. A feat I'm trying to replicate again. From a humanitarian standpoint. It would be an incident at my 30th Aninversary party. Lyman Sheats was there and brought souvenirs to hand out. There was a father brought his little girl in to play pinball. She was cute, the perfect kid. About 8 years old, missing a tooth, freckles. I asked Lyman if he'd do me a favor. Autograph a Medieval Madness poster for the child. Lyman did. I gave it to the girl. She was thrilled. The next day the father called and thanked me for the poster and that he hung it on his daughter's wall. She loved it. I suggested he should get it framed. When he asked why I told him to look at the autograph and then the design credits on the playfield. He was all excited, he said he'd get it framed for his daughter. Nothing in the world like putting a smile on a child's face. TPB. We've all made some great friends through pinball. Is there an individual you have met this way who you're glad you did and what influence have they had on your life and/or business? LTG :) . Steve Tsubota. Only person I've ever met who I wished I was more like. TPB. In 5 years do you think there will be anybody designing or making pinball machines? LTG :) Stern pinball. I don't know if Gary Stern will still own it, or be as active in running it. But they are surviving in the worst of times, and I think will continue for some time to come. If the economy turns around and the hobby stays strong, I believe we may see a custom manufacturer or two pop up. But it would be very limited runs and extremely costly. Namely for the rich and famous. TPB. If you had a time machine and had a chance to go back to where you started in the business, would you take a different path? LTG :) When I got out of high school, if I had the money to start the schooling, I'd be in radio broadcasting now. I would have never continued working for my father. As far as my business, the average life of a game room is a year and a half. So I never dreamt of being there over 36 years. Had I known that then, I would have stood in the center of the room and taken pictures front and back to see the changes in games and technology. I would have kept a diary too. Why I got a game, why I didn't, and if I did, pictures and notes about it. I was a test operator for 19 years, so I had a lot of odd ball stuff come through here. TPB. Is there a pinball place or event, anywhere in the world (other than SS Billiard of course) that is worth a visit for every enthusiast? LTG :) Of places I'd like to see and haven't: the woodrail pinball museum in France, Pinball Hall Of Fame in Las Vegas, and any pinball show anywhere on the planet, big or small. Of things I have seen: Pinball Expo in Chicago. Especially with their Silver Anniversary this year. I've always loved Expo. So much to see and do. Mike and Rob put on a heck of a show. Stern tour, seminars, tournaments, increasing time pins can be played, banquet, which is a tradition in itself, fireside chat. And the people. You never know who you'll run into. Old friend, new friend, somebody famous from the industry, somebody famous from supporting and promoting pinball. I like to land there, grab some souvenir mugs to hand out, and then mingle. I like to go with the flow. A bunch of people go to lunch, tag along, get back, another group are leaving and go with. I've had three lunches in a row. You just never know who you'll all run into. I am sad I can't see everybody and spend time with them or even get in a game of pinball with them. I love Expo and all the people there. TPB. As an enthusiast, what in your opinion was the best pinball machine ever made? LTG :) While I'm not much of a player and rarely get to play, I've always loved Capcom's Kingpin. TPB. Now, as a businessman, what has been the most successful pinball machine for you, and if you know, why? LTG :) Funhouse. Wore out two playfields on one here. I believe it was the game that kicked off the modern era of pinball as we know it. It really launched the 1990's for pinball. TPB. If you had to sum up pinball in one word or sentence, what would it be? LTG :) One of the few things built by man that is almost alive. Many thanks to LTG :) from SS Billiards who despite his modesty, really is a leading authority on RGP. Many people join in and ask for help, countless thousands of others will just be finding his answers on a search engine from the other side of the world. If you ever find yourself in Hopkins, Minnesota, then be sure to pop along to play the games and meet the great man himself. And of course we welcome suggestions for future Pinball Heroes victims.